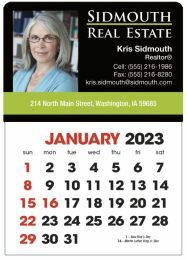 A variety of Adhesive Calendars, Sticker and Mini Stick Up Calendars for all year round exposure. 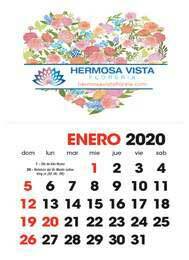 Mini vinyl promotional adhesive calendar is an economic advertising billboard. 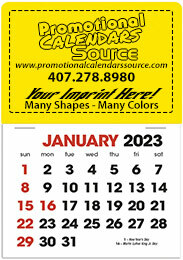 Mini stick-up adhesive promotional calendars in a variety of vinyl header shapes, colors, imprint colors and grids. Custom shapes available. 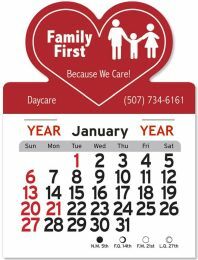 Promotional Adhesive Calendars are self adhesive Mini Billboards suited for any business. Customized with your information and for few cents per calendar, your company receives 12 months of exposure! 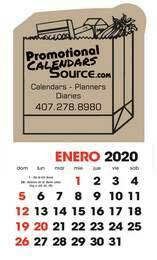 Promotional Calendars deliver your message 24 hours a day, 7 days a week, 365 days a year.